The atlanto-axial joint is a joint between the first and second cervical vertebrae; the Atlas and Axis. It is a complex joint made up of three synovial joints and constitutes the most mobile articulation of the spine. The middle (or median) joint is classified as a pivot joint and the lateral joints are plane articulations. There are two lateral atlanto-axial joints which are concave in an anterior-posterior direction, this allows rotation. The median atlantoaxial joint is the articulation of the: . Between the articular processes of the two bones there is on either side an arthrodial or gliding joint. Rotation is the primary movement at this joint - 60% of cervical rotation (50°) comes from the atlanto-axial articulation. 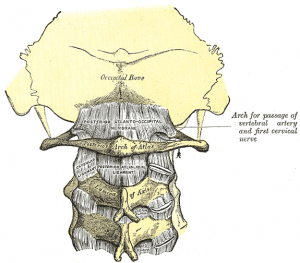 This is allowed by the pivot articulation between the odontoid process of the axis and the ring formed by the anterior arch and the transverse ligament of the atlas. Flexion (10°) and Extension is limited by tectoral membrane. Side flexion is around 5°. 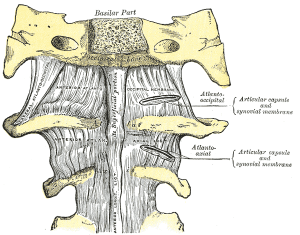 Transverse ligament: Should the transverse ligament of the atlas fail due to trauma or disease (such as rheumatoid arthritis), the dens is no longer anchored and can travel up the cervical spine, causing paralysis. If it reaches the medulla death can result. Alar ligaments: stress or trauma can stretch the weaker alar ligaments, causing an increase in range of motion of approximately 30%. Posterior Atlanto-Occipital Membrane: genetic traits can sometimes result in ossification, turning the groove into an foramen.